Welcome to my Atari 8-bit computer software relics. This is an archive of some of the more interesting or amusing bits of software I wrote as a kid — between 1986 (when I got a floppy disk drive for my 11th birthday) and 1997 (when I was 22, just before graduating from college and becoming busy with real life and day jobs). Almost none of this was previously released, and much of it is unfinished. Learn more about this archive & the author. 2014-01-18 - After a short hiatus, I've uploaded more disks. (Most of what's left that I feel is even barely worth uploading is digitized graphics.) Two of the disks (11 and 59) contain Minarets and Memories, my epic attempt at digitizing a chunk of a music video back in 1993. The other two (7 and 35) contain an assortment of mostly Atari BASIC games from 1989 and 1990, including reasonably playable attempts at Connect 4, Othello and Checkers, an utterly incomplete and barely playable homage to the children's cartoon "Count Duckula", and more. 2013-09-14 - Photos of some of the programs from disks 15 and 45 have finally been uploaded. 2013-09-03 - You can now browse by the development status (finished, unfinished, or unknown). 2013-09-02 #2 - I broke the "games" category into a number of subcategory (e.g., "games-sports" vs "games-rpg"). Also, some of the "Browse by" lists now show how many items are currently in each group. 2013-09-02 #1 - After going through another half-dozen physical floppies, I've assembled two more disks-worth of files: 9 & 22. They include, among other things, another (bad) attempt at Super Mario Bros., a jigsaw puzzle, a few more attempts at sports games (boxing, ice hockey, skiing, sky&nbs;diving, soccer, and weight lifting), and ports or clones of games from other platforms ("Gates", based on an Apple II game, and "Garbage", ported from a Timex Sinclair 1000 book of type-in games). 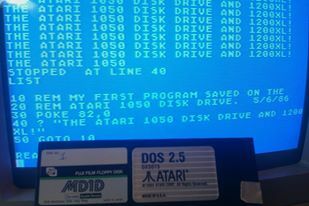 2013-09-01 - I've added another disk's worth of programs, 47, including Geometric Drawing Language (which even has a converter to Atari BASIC), and my attempt at cloning Imagic's Atari 2600 game "Dragonfire", "Crown Quest". Also, I added a "browse by disk" option, as well as the ability to sort the lists of programs on the various browse-by pages (by title, year, status, or language). 2013-08-31 - Welcome! I've posted a few disks' worth of my relic programs: 6, 8, 37, 43, 54. I need to improve the summaries and descriptions, and describe the finished/unfinished state of more things, but it's a start! Among this batch includes a gem: Isolation, a Commodore 64 BASIC game by John Dearden, which I ported to Atari BASIC soon after it was first published in Compute! 's Gazette in May 1990. By the time I got online and spreading my software to BBSes (1991), FTP sites (1992), and eventually my own website (1996), I had forgotten all about it! Expect more posted soon. I still have 3 dozen 5.25" disks from which I'll be extracting relics!